Haven’t decided on a hotel yet? 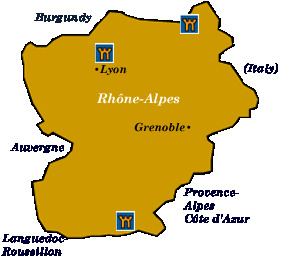 You can look at other available hotels in the Rhône-Alpes region with Booking.com. The majestic snowcapped peaks of the Alps and the strategic Rhône River lend their names to this geographically diverse region. A mere one-hour train ride will transport you from vineyards, orchards, and vast fields of sunflowers to soaring mountains, pristine Alpine lakes, and centuries-old stone villages. Roman ruins, castles, the Grand Canyon of France, and exquisite gourmet food reward those who take their time to meander the quiet country roads in the lowlands. World-class resorts up in the mountains offer ski runs, hiking trails, and a venue to see and be seen the year round. The castle hotels of the region are diverse as well; each makes a good base from which to explore the local sites, whether it’s the vineyards of Beaujolais, Lake Geneva, or the Roman ruins along the Rhône River. Lyon Although Lyon is France’s second city and an industrial center, Vieux Lyon (the old quarter) is unsurpassed for its medieval and Renaissance buildings, cobblestone streets, charming covered passageways known as traboules, bistros (the cuisine of Lyon is considered by some the finest in France), and fashionable shops. The Musée des Beaux-Arts, situated in a former Benedictine abbey, presents an outstanding collection of paintings and sculpture from ancient Egypt to the present, second to that of the Louvre. Since Lyon is the silk capital of France, at the Musée des Tissus you’ll find a fascinating collection of priceless fabrics, including brocades that once hung in Marie Antoinette’s bedchamber. The Beaujolais vineyards Wine lovers throughout the world eagerly await for the Thursday of every November when Beaujolais Nouveau is released. Almost every village along the Beaujolais wine route has its own wine cellar, offering tastings. Villages worth discovering are Juliénas, Beaujeu, Brouilly, Villié-Morgon, Fleurie, and Moulin-à-Vent. Vienne The Romans soon discovered the strategic value of Vienne’s position between the river and hills. One of the largest amphitheaters in Roman France, the Théâtre Romain, is still used for public performances, including an international jazz festival in July. The city’s most importance architectural treasure from the Middle Ages is the Cathédrale de St-Maurice, which combines Romanesque and Gothic styles. Gorges de l’Ardèche Considered the Grand Canyon of France, the fast-flowing Ardèche River slices through this unique geological area, leaving ravines with depths of over 285 m (935 ft.) and fantastic limestone, basalt, and granite formations. If driving the panoramic D-290 road along the rim is too tame, you may rent a kayak or canoe and take on the river itself. Chamonix and Europe’s highest mountain, Mt. Blanc, can also boast of the world’s most harrowing cable car experiences up to the Aiguille du Midi, Le Brévent, and Le Montenvers. Annecy, surrounded by snowcapped mountains and set at the tip of dreamy Lac d’Annecy, has a small medieval quarter with arcaded streets and flower-covered bridges. Grenoble, the ancient capital of the Dauphine, is a lively city blessed by a spectacular setting (the Musée de Grenoble has a collection of Impressionist paintings worthy of a visit). Olympic ski resorts beckon at Courchevel and Val d’Isère.